The Crawford Fund’s WA State Committee is proud to have sponsored three scholars to attend the 2017 annual conference on ‘Transforming Lives and Livelihoods: The Digital Revolution in Agriculture’. The Crawford Conference is an important event for international development, which focused on the critical food challenges for global sustainable development. I have worked in Post-harvest Biosecurity and Food Safety Laboratory for four years. My research interest areas are food safety and nutrition. I think my research interests will benefit developing countries. So the Conference was an excellent opportunity to make the linkages with people who had lots of experience with the ability to see the potential benefits my research could offer developing countries, and to point out to me strategic avenues for me to engage in. This was important, as I am keen to ensure my work results in immediate benefits both to the wider community and to myself as a scientist benefiting the world. During the mentoring program on the Crawford scholar day and conference, I was mentored by Prof James Ridsdill-Smith, who gave me many useful suggestions on how to engage with researchers and policy makes in agricultural science both inside and outside Australia. The two half day lessons were also pretty handy to me, as a young early career researcher. This was from a number of points of view; I collected many new ideas that resonated with my research interests from both senior research scientists and young scientists. For example, how to become motivated, the importance of developing skills in data management and analysis, understanding the value of doing a PhD and the importance of good supervisors. I definitely felt the lessons were well prepared and designed to cover everything needed for all scholars attending the Conference. I believe the Digital Revolution in Agriculture will definitely benefit agriculture development internationally; the questions for me were how to effectively engage in the post-harvest field and to understand how much the new technologies can cost farmers. I captured and absorbed comprehensive knowledge around digital solutions from the speakers at the Parliament House Conference, and I am now going to consider the use of digital solutions in my areas of research. One of the important lessons from the conference was how to share the data, to make it easily accessible and to apply the knowledge I obtain to benefit international agriculture development. In addition, I am curious enough to keep an eye on how to validate and to quality control shared data. In summary, the 2017 Crawford Fund annual conference was extremely beneficial to attend and to meet people who are working in areas related to my research interests. I also met a lot of people who are not working in the same area as me, e.g. agri-business, social work, volunteering to name a few. Through the conference program, I obtained many new ideas and my vision and aspirations changed. I have now re-assessed as to how I might deliver my research findings to people and communities outside Australia. I now understand how important and necessary it is to work with social scientists, value chain specialists, international volunteers, agri-business people and others in disciplines outside my immediate research area, if I am to effectively get my research used widely both internationally and in Australia. Education, mind exchange and networking were the three key words I returned with after the conference. My bag was full of take home messages when I came back to Perth, and I couldn’t stop talking about the conference to my colleagues. Finally, I add the Crawford Fund introduction into my talks I give to overseas students and visitors on training programs to our laboratories in Perth. We have many visiting groups from Thailand, Iraq and China. The greatest challenges we face are those that we sometimes are not sure to take ourselves; but influenced and encouraged from our peers. Until a few months ago I personally had not understood what the Crawford Fund was, let alone what it did or the opportunities it could provide. After being selected to represent W.A as a scholar and embark on a 2 day conference with such amazing people, I wish that I had been informed of this great organization, and the work they do a decade ago when I was leaving university. In saying that I am challenging myself, to ensure that I can get the message out to the next generation and expose them to the amazing opportunities that they can embark on. I am not a scientist, but have been involved in research over my career. I have always been passionate in connecting people and in my career have invested much of my passion to on ground delivery of information and research to ensure farmers are getting the answers and issues they need addressed, to ensure continued growth and sustainability in feeding the world. 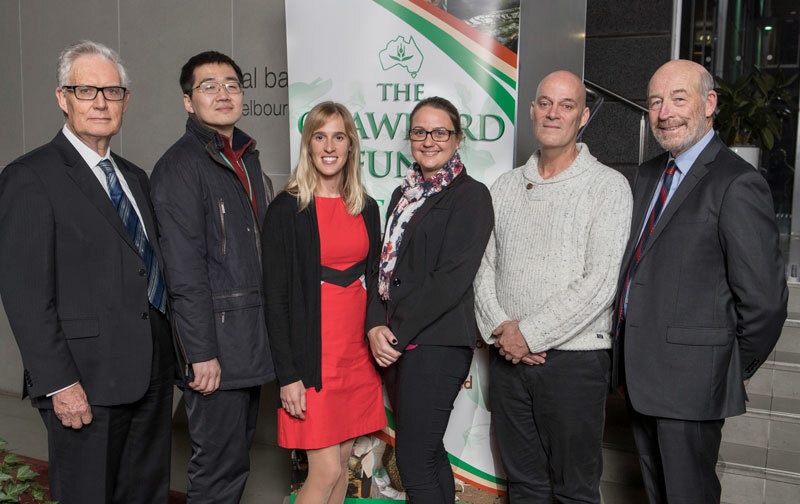 The Crawford Fund gave me the most amazing experience in meeting so many people from within Australia and throughout the globe, working in agriculture and of the same passion for feeding the world and remaining sustainable. The scholarship allowed for me to expand horizons and contacts in which I would not have traditionally come across in my day-to-day work; and I am hugely thankful for the opportunity. Whilst I have worked in agriculture for close to 8 years, I must admit that my thought pattern had never previously expanded far from the farm gate, and the provisions for being successful were to produce more and ensure that markets were accessible. The Crawford Fund really opened my eyes to the need for looking further, globally and with more of a focus on actually feeding the world ‘nutritionally’ not just by quantity. I am hugely excited to transfer this knowledge and inspiration onto the next generation and for those who are still working within the agricultural industry or would like to enter into it. There are so many experiences all over the world and through many different facets, and I encourage you all to ask the question and challenge yourself to do something for the industry that we all work in each and every day. Whilst research is critical, the follow on from this is to ensure that it is adopted and that the extension is completed correctly for all involved to benefit. I am challenging myself moving forward to embark on opportunities to disseminate information from research not only locally but internationally and hope that grower groups can provide a key link to the delivery of programs and assist in the evaluation of adoption on a great scale; with experience in peer to peer learning and specialized programs. Thank you immensely to the fund for your support, I look forward to many opportunities moving forward and for the extension of knowledge of such a wonderful industry that feeds us all every day. As a first-timer to the event and a close-to-graduation PhD student, I found the 2017 Crawford Fund conference and scholarship program to be an extremely valuable experience for a number of reasons. First, I have learnt from a wealth of knowledge emerging from a number of young and senior researchers from multiple backgrounds. One of the most enriching aspects was the fact that, as participants, we were not necessarily linked through our area of expertise (as it often happens in professional gatherings), but rather by our common desire to make a difference in the world through smarter, better agriculture. Thus, the conference has broaden my research interests and sparked my curiosity in fields as varied as robotics, big data, mobile technologies, parasites, genetics, nutrition security, ethics, diversification, and policy, among many others. As PhD students, we tend to concentrate on our own narrow area of research (otherwise, we would never graduate!) and sometimes lose sight of the bigger picture. Attending the Crawford Fun event has definitely helped me put things back into perspective and gain a better understating of how many multi‑disciplinary pieces fit together into the jigsaw puzzle of international agricultural development. Another aspect of the Crawford Fund conference that makes it a unique opportunity for young researchers is the mentoring program. Whether you are the shy type or a natural extrovert, making meaningful connections at large events is never an easy task. Crawford mentors not only took the time to get to know their scholars, but also helped us understand ‘who is who in the zoo’ and introduce us to those who could give us a particularly helpful word of advice. Personally, I’ve met some researchers outside of my area of expertise, whose work I find fascinating and want to learn more about. At the same time, having colleagues say: ‘I don’t know the answer to your question, but I’ll get you in touch with someone who does’ made me appreciate the power of the Crawford Fund network. If it’s true that we are all connected in this world through ‘six degrees of separation’, then the Crawford Fund has definitely helped me bridge at least three of them. Finally, I’d like to reflect on the fantastic opportunity to connect with other students and young professionals through the scholarship and RAID programs. Sharing breakfasts, dinners (and even rooms) with other fellow scholars has made this conferences one of the most fun and enjoyable, from the personal standpoint. If not at the Crawford Fund conference, where else would you find yourself enjoying a late dinner, on our capital’s foreshore, with a bunch of newly-met friends, laughing your hearts out over your fieldwork misadventures?